Park, whose full name is Parkington Waddell Broughton the fifth, has never known his father, who died in the Vietnam war. His mother refuses to talk about Park the fourth at all, preferring to leave the past in the past even if it keeps her son in the dark. When Park continues to press for information after a visit to the Vietnam War Memorial, however, his mother finally agrees to let him spend some time with the Broughton family on their farm. 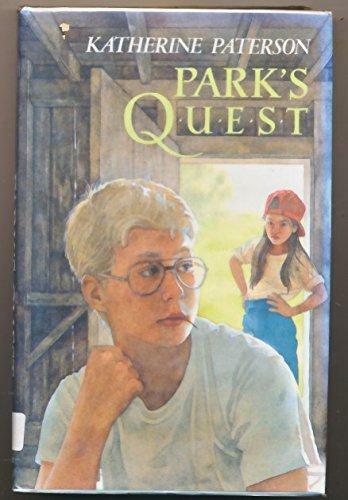 Imagining himself as an Arthurian knight on a quest, Park is determined to make a good impression on his grandfather, but he soon realizes that the elderly man is unwell, and that his uncle, Frank, is married to a Vietnamese woman, a member of the very race Park blames for his father's death. Worse yet, Frank's wife has a daughter named Thanh, who seems very hostile to Park, and who he sees as competition for attention from his long-lost relatives. It is only after several days spent piecing together the past that Park begins to understand how he might fit into the family. As much as I love Katherine Paterson, I have to admit that this book was a bit of a muddle at times. Paterson intersperses the action of the story with scenes from Park's imagination, and after the first few instances, it becomes tedious. Most of these moments seem identical in tone and content, and it is very easy to skip them and still comprehend the story. Had I been editing this book, I think I'd have taken most of those digressions out of it entirely. I also think this book is predictable, at least for adults. The revelations Park uncovers about his dad are just the sort of thing I'd expect to discover in a novel set after the Vietnam War, and they are not at all original. There are also a lot of mature themes - divorce, an extramarital affair, issues of paternity - that seem to blindside the reader near the end of the book in a way that I think would have been jarring for me as a kid, and probably would be for my girls as well, even in a few years. The last time I reviewed a Paterson book, I mentioned that my husband and I had both concluded that her books would always deserve four or five stars. I guess Park's Quest is the exception that proves that rule. It was a three-star read for me, and not one I'm particularly interested in revisiting any time soon.